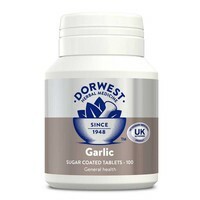 Dorwest Garlic Tablets are a licensed herbal medicine used for the symptomatic relief of coughs and bronchial conditions. Trusted as an antibiotic, antiseptic, antiviral and to maintain a healthy circulation, Garlic is a real all-round aid to health, and renowned for its health-giving properties, whilst providing a hostile environment to parasites. 1 Tablet per 5kgs bodyweight daily. Can be given indefinitely for general health. Garlic can be toxic to cats and dogs. Do NOT exceed the dosage stated by the manufacturer and contact them directly if you require further information.